3.5 stars. 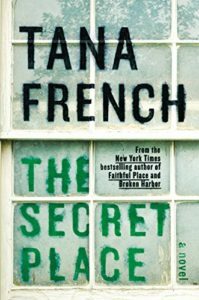 The Secret Place was somewhat of a departure for Tana French. I’m not sure if it was quite as successful for me personally, but it makes me really happy to know she’s experimenting and keeping things fresh. She could just churn out novels and people would read them even with diminishing returns at this point. It makes me love her all the more to know that she has no intention of phoning it in. Detective Stephen Moran is surprised one morning to see Holly Mackey in the office of the cold case division. She’s brought him a piece of evidence about a murder at her all girls school a year ago. He dutifully takes it to the murder squad and teams up with Antoinette Conway to see if they can dig up new evidence. The entire story takes place in one day at the school with the narration switching from the detectives in present day and Holly’s group of friends before the murder happened. Teenage girls don’t exactly have it easy and for some reason our culture likes to make fun of them an awful lot. It was nice to see an adult book taking teenage girls seriously. There’s intrigue and drama of course, but there’s also real depth to the characterizations of these girls. On top of that pleasant surprise, The Secret Place gives us a complex beginning to Conway and Moran’s partnership and more Frank Mackey as a protective father. I wish we got to see glimpses of past detectives more often honestly. I really hope we get to see more of Holly in a future book. Share the post "Keeping things interesting"